I loved Shrek! It was a fantastic movie that was funny, exciting, charming, and worked on two different levels for both kids and adults. In fact, I don't know anyone who DIDN'T like Shrek. Yeah, it was that good. And then came the sequel, which was, in my opinion, a bit disappointing. I didn't care for the plot, where Shrek once again misunderstands Princess Fiona and thus goes about doing the wrong thing. I thought it lacked the intriguing conflicts found prior, and severely toned down the Ogre-esque attitude that was so prevalent in the first feature. I know some people out there agree with me, while others really enjoyed this release. 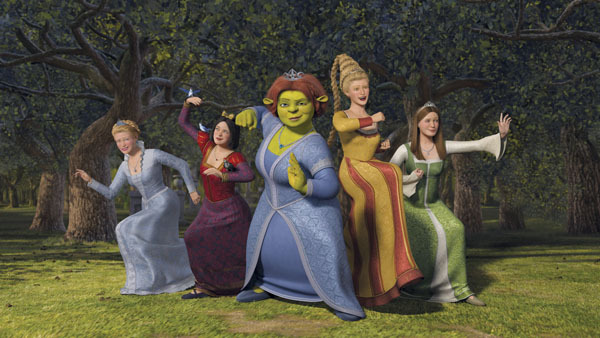 Now Shrek is back in his third full-length CG animated feature, Shrek the Third. This time, there is no real misunderstanding between Shrek and Fiona. The commercials and previews made the film look like it was about Shrek having kids, but really that's only I tiny part of the movie, and actually not what it's about at all. So right off the bat, we have deceptive advertising leading us into believing we're going to see a story that Shrek and his rugrats. They did this with the second movie too, leading us to believe it was going to be all about Shrek's conflict with Fiona's parents, when really it was about Shrek's misunderstanding of what Fiona wanted. Anyway, so Shrek isn't fitting in so well with all the official ceremonies and whatnot that are now required of him. When the King dies, making Shrek the new leader of the Kingdom, he chooses to leave Fiona and go off on an adventure to find Author, the only other person who can take his place as king. Unfortunately, when Shrek actually finds Author (or Artie as he likes to be called), he discovers that Artie is just a geeky high school kid... not quite what comes to mind when you think of king-material. But Shrek is determined, so he grabs the kid and heads back to the lad of Far, Far Away. Of course, they have to run into some trouble along the way, which makes for a few laughs and a lot of yawns. Donkey and Puss-in-Boots end up getting swapped into each other's bodies, which probably sounded funnier on paper, and Shrek goes through the motions of trying to handle a rebellious teenager. It all kind of feels like we've seen it many times before on various television shows and movies. Meanwhile, back in the land of Far, Far Away, the land has been taken over by villains and the princesses have been locked away in dungeons. But these are no helpless women! So with Fiona's mother in charge, they choose not to wait for rescue, and to take matters into the own hands. So they bust out and for a plan to take back their kingdom! And truly, this part was much more fun to watch that Shrek's part of the story. At any rate, kids are sure to really enjoy this, but I'm thinking adults won't care for it nearly as much as the first film. I know I didn't. It lacked the duality that made the first one work on two different levels, and lacked the charm that the first one had in abundance. But if you're a kid, then you probably won't notice any of that. Shmash Ups: Make your own Video! Hear ye! Hear ye! Prepare for king-sized laughs as DreamWorks Animation’s newest adventure in the largest theatrical animated franchise ever gets the royal treatment on DVD and HD DVD on Tuesday, November 13th. “The best Shrek yet” (Pat Collins, WWOR-TV), Shrek the Third has earned over $785 million in worldwide box office and secured a spot as the largest domestic animated film opening and the third-largest debut in cinema history. Shrek the Third chronicles the continued adventures of Shrek, Fiona, Donkey and Puss in Boots from Shrek* and Shrek 2 with new characters including a magical, misguided Merlin, an awkward Arthur, a powerful posse of Princesses and a bundle of unexpected arrivals. As the all-star cast and characters you love return for another all-new royal adventure, the biggest comedy of the year becomes the must-have home entertainment event of the holidays. 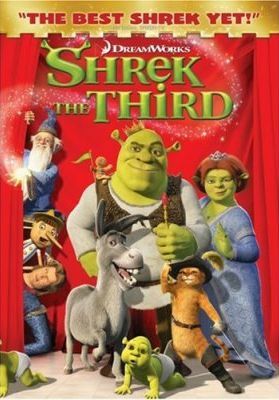 The Shrek the Third DVD and HD DVD presentations are ogre-loaded with bonus material, giving viewers the chance to join the whole Shrek family for hours of entertainment and activities. Everyone with two legs (or four) can master the “Donkey Dance” with the help of Donkey’s wildly entertaining step-by-step instructions. In “Shrek’s Guide to Parenthood” viewers receive wise and wacky parental advice from Donkey, Puss in Boots, Pinocchio and Gingy. In addition to cast profiles, “Lost Scenes,” “Big Green Goofs” and much more, Shrek and Donkey provide “How to Be Green” environmental tips for kids. The DVD includes a wealth of exciting DVD-ROM features, such as “Shrek Shmash-Ups,” which allow aspiring filmmakers of all ages to choose and mix scenes from all three Shrek films and put them to music, as well as many more Shrek-tivties including printables, games and more. The HD DVD includes a number of interactive and web-enabled features. “The Animators’ Corner” is an all-new, interactive, picture-in-picture experience featuring storyboards relevant to the scenes on screen, plus branching to the “Lost Scenes;” “The World of Shrek” is a movie guide that provides biographies of key characters and the actors who voice them; “My Menus” are customizable character-themed menus; “Shrek’s Trivia Track” features pop-up fun facts; and “Donkey’s Digital Coloring Book” is an interactive coloring book that allows viewers to digitally paint their favorite scenes.